Monday classes, 7:30pm - 9:30pm, are at Sandon School, Molrams Lane, CM2 7AQ. 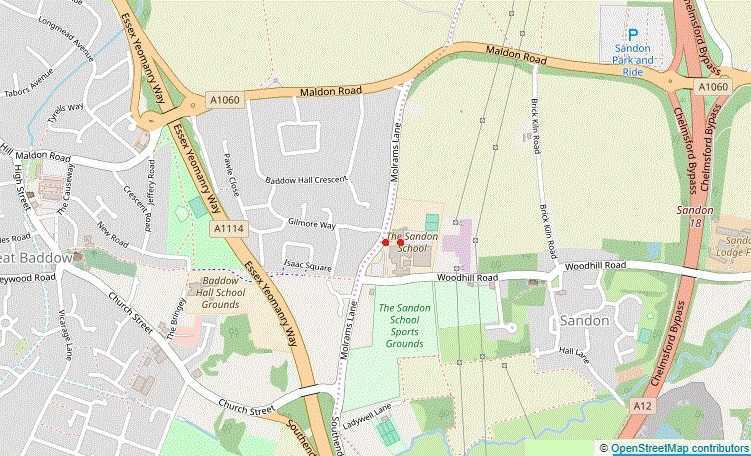 Map for location: Sandon School. The left marker is the road entrance off Molrams Lane. There are plenty of car parking spaces in the School car park. The right marker is the new sports building. Walk round the north side of the building, through the high gate, then to the left into the new sports building. Classes comprise a mixture of basic step and formation practice and social dancing. The dances we do each week are usually selected from the programmes for forthcoming main dance events in the Essex area. You are welcome to attend the classes, regardless of age or experience. Don't worry if you've never danced before, because there are plenty of people who will be able to help you! Please note that shoes must be non-marking to comply with school rules for use of the Gym. Avoid shoes with black rubber/black plastic/black polypropylene soles. Classes cost ₤5 per night for non-members. First class that you come to is free of charge. Annual membership (Sept - June) costs ₤15 plus ₤4 per night for members.